A chance encounter on a bus was the start of a remarkable journey for Mark Hodgkinson and Scott McComiskie. They decided to go backpacking together and during their year away landed jobs in a bar in Sydney where they learnt to mix cocktails and perform flair tricks. Back home the friends realised there was a demand for premium mobile cocktail bars, with experienced staff, and that they were ideally placed to meet it – and so they set up Mojito Events. Event packages, themed bars, drinks packages, event staff, entertainers, a photography booth and furniture hire – the pair were full of ideas and plans to expand the business. They were keen to get going on them straight away, so started looking around for funding. Mark found ART on the internet and applied for a loan. It was approved. The loan was used to help buy and fit out more bars in different styles and to buy some designer event furniture. 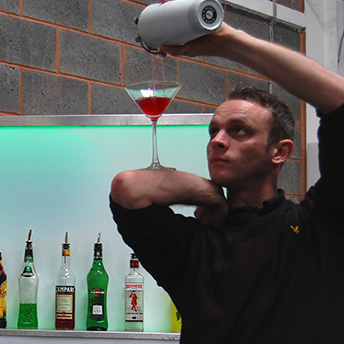 Mojito Events is flourishing and Mark and Scott have ambitious plans for the future. Eventually they aim to offer everything an event organiser needs. Their corporate workshops – excellent for team building – are taking off and they are beginning to attract interest from celebrities.